Sendero PC Maps is included at no additional charge with new Sendero GPS version 22 and Sense Navigation with the option to upgrade to GPS functionality for an additional fee. Orders must be placed directly with the Lighthouse at 1-888-400-8933. Be prepared to provide your serial number and product version. Sendero Group expands the power of accessible location information to the Windows PC with Sendero PC Maps and GPS. Sendero PC Maps and GPS allows the user to have fun exploring his or her environment and to develop location literacy in the process. Sendero PC Maps can be used for virtual map exploration or can be upgraded to have GPS capabilities so that you can also have real-time location information as you travel through your environment. Explore rural roads or city streets, intersection-by-intersection. Teachers, family, friends, anyone can follow along with the integrated visual maps. Record personal Points of Interest (POI) and add rich audio content like restaurant menus or museum descriptions. Effortlessly share these POIs in real-time when you sync with the Sendero servers or your Sendero GPS or Sense Navigation product. Hear your direction of travel. Check the odometer for distance traveled. Search the database of 15 million Points Of Interest in North America for everything from airports to zoos and choose one as your destination. Create and follow a route to that destination. Or turn on the manual route creation and create the route while you explore the maps. Easily save and print or emboss routes to take with you or to share. Create longer more complex routes on the PC and then transfer them to your Sendero GPS or Sense Navigation product. 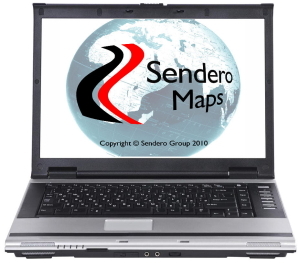 Sendero PC Maps and GPS v22 only, for customers who do not own any Sendero products, One year PC Map license, no hardware included download only, contact Lighthouse for purchasing. Sendero PC Maps v22 only, for customers who do not own any Sendero products, One year PC Map license, no hardware included download only, contact Lighthouse for purchasing. Sendero PC Maps Upgrades, contact Lighthouse for purchasing. Upgrade from Sendero PC Maps 22 to Sendero PC Maps and GPS v22, contact Lighthouse for purchasing. European map bundle includes Austria, Croatia, Denmark, Finland, France/Monaco, Germany, Greece, Italy, Luxembourg, Netherlands, Norway, Poland, Portugal, Republic of Ireland, Slovenia, Spain, Sweden, Switzerland, United Kingdom and more. To purchase Additional Country Maps, contact Lighthouse for purchasing. Resolved compatibility issues with 2017 maps and POIs.